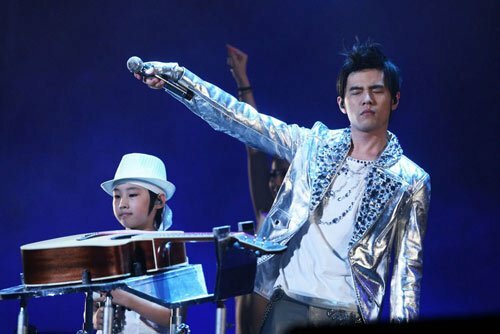 The entertainment market in Taiwan produced many giant stars, such as Jay Chou, who revolutionized the Mandopop, and Jacky Wu, whose hosting style has been learned by many followers and influenced the development of talk shows and many other entertainment television programs. Many stars from the entertainment market in Taiwan also have a widespread popularity in countries such as Mainland China, Singapore and so on. Without doubt, Chinese is used in most of the major countries in Asia, such as Mainland China, Hong Kong, and Singapore. The common knowledge of this language enables these countries to communicate and interact in an intimate way. This condition also benefits the cooperative development of the entertainment market in these countries, which means that it is easier to develop overseas market. The entertainment market in Taiwan was once the most prosperous in the Chinese language circle during the 1980s and the 1990s. Stars from Taiwan were popular in other countries of the Chinese language circle. Music and dramas were also often played in other countries. At that time, the entertainment markets in these countries of the Chinese language circle besides Taiwan have not developed their own entertainment markets, and thus the entertainment market in Taiwan was usually the model these countries referred to learn from. A lot of television program formats, such as outdoor gaming, question answering and talk shows, and music styles, were first produced in Taiwan. The entertainment market in Taiwan can be regarded as an pioneer in terms of innovation. The entertainment market in Taiwan is coming through several obstacles. First is the lack of investment from enterprises results in the insufficiency of funding to produce TV programs or music. Without enough money, the quality of entertainment products can not be ensured. What’s worse is that if money is not enough, even though there are excellent ideas, these ideas can not be put into reality. This is a serious waste of talents and opportunities. The second obstacle is that the small amount of population and the size of this small island result in the small size of the entertainment market in Taiwan. The types of stars and entertainment products are thus limited and sometimes repetitive faces are often seen. The third obstacle is that the entertainment market is experiencing transition. The amount of television-watching population is decreasing and less and less people tend to purchase CD. Internet has become an important tool for the young population. This leads to a great loss of target population.